Companies seeking to enhance their new logistical operations in the Northeastern region of the country may have a new shipping option in the months ahead. A shipping firm from Iceland recently decided to sign a contract with the Maine Port Authority to develop container freight service in one of the state's largest cities, Portland. Eimskip, also known as the Icelandic Steamship Company, will have a container ship make a run to Portland every two weeks, according to a report from The Associated Press, which will provide the state with increased economic activity and provide firms with new shipping options and allow them to be better connected to supply chains that operate within Canada, Europe and other regions of the Northeastern U.S. The company's goal with the port is to reduce transatlantic shipping times, and it will also allow some companies the potential to get their products to other countries at a lower cost than they may have been able to in the past. The AP reported Portland was previously a shipping hub, but has not had a container cargo service in nearly a year. A company that previously ran routes that connected Portland with Boston and Halifax decided to stop services several months back. "Maine's economy will be strengthened by this new service and accessibility to markets," said Maine Governor Paul LePage, "Maine produces some of the best products in the world and this investment by Eimskip is a testament to that quality." However, the deal won't just bring water freight options to businesses looking to make this hub a part of their supply chains. 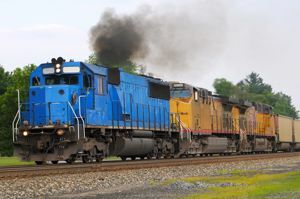 Eimskip will partner with Pan Am Railways as a part of the deal, which will allow companies seeking rail options additional ways to transport their products, which could result in a business cost reduction for many firms. The additional options companies will be offered once the plans are put into motion signals how important multiple choices are for businesses looking to enjoy greater cost savings, streamline operations and ensure their logistical strategies are as simplified as possible. With new rail and ocean shipping prospects soon to be put in place, companies could find their operations relying heavily on one - or both - of the new logistical options in the Northeast.